Keywords: hyperbaric oxygen; wound healing; oxygen effects; infection. Oxygen used under pressure or hyperbaric oxygen (HBO2) can assist wound healing. HBO2 is considered unnecessary in simple, well-perfused wounds, but can be used successfully in hypoxic or ischaemic wounds such as diabetic wounds, venous stasis ulcers, failing grafts and flaps, necrotising soft tissue infections and refractory osteomyelitis. In wound healing, hypoxia is an insufficient supply of oxygen which prevents normal healing processes. HBO2 provides the oxygen needed to stimulate and support wound healing. HBO2 is able to combat clinical infection such as gas gangrene by acting directly on anaerobic bacteria, enhancing leukocyte and macrophage activity and potentiating the effects of antibiotics. HBO2 is a relatively safe non-invasive therapy. Side effects include middle ear and pulmonary barotraumas and myopia. Contraindications include poor cardiac output and severe obstructive pulmonary disease. Oxygen is one of the most versatile and powerful agents available to the modern medical practitioner. The therapeutic use of oxygen under pressure is known as hyperbaric oxygen therapy (HBO2) and has been used to assist wound healing for almost 40 years. HBO2 has several specific biological actions which can enhance wound healing processes. Hyper-oxygenation of tissue, vasoconstriction, down regulation of inflammatory cytokines, up-regulation of growth factors, antibacterial effects, potentiation of antibiotics, and leukocyte effects of HBO2 are discussed in relation to wound healing problems. This article looks at how a greater understanding of the biological and physiological effects of using oxygen under pressure can benefit patients with problem wounds. 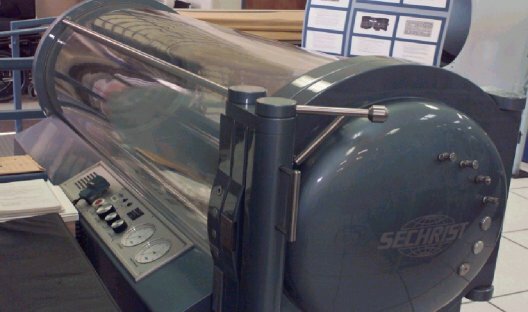 HBO2 was first used to recompress divers by Behnke in the 1930s , and was developed to complement the effects of radiation in cancer treatment by Churchill-Davidson in the 1950s . Within a few years HBO2 was being used to support patients undergoing cardiac surgery , and to treat clostridial gas gangrene  and carbon monoxide poisoning . HBO2 was first used to assist wound healing when it was noted in 1965 that burns of the victims of a coal mine explosion, treated with HBO2 for their CO poisoning, healed faster . In spite of this long history of therapeutic use, the mechanisms of action of HBO2 are still being discovered. As we learn more about how oxygen interacts with living organisms, new treatments and parameters of use are suggested. Today, the medical use of oxygen under pressure, or hyperbaric oxygen, is an evolving specialty. Hypoxia can be defined as an insufficient supply of oxygen to support biological processes. It is possible to have hypoxia in one area of a wound and not in an adjacent area. Similarly hypoxia can be time-dependent with sufficient oxygen to support basal tissue maintenance at one time, but not enough to allow for growth or healing at another. Thus it is difficult to place an absolute number for PO2, which can be used to define hypoxia in all situations. 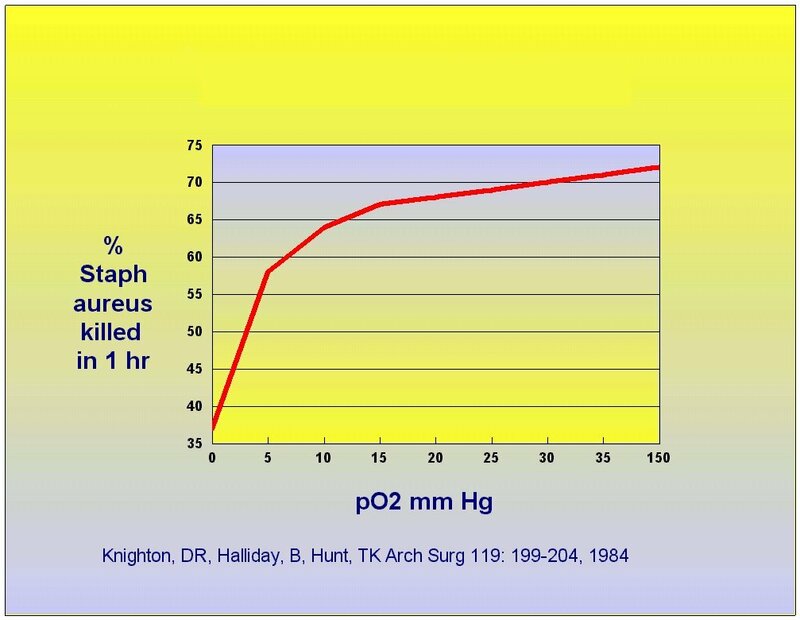 Hypoxia in anaesthesia is defined as an oxygen saturation less than 90% or a PaO2 of < 60 mmHg . This is clearly a higher level than the tissue oxygen pressure of 40 mmHg needed to reliably heal a leg wound . In wound healing, hypoxia can be defined as an insufficient supply of oxygen to allow the healing process to proceed at a normal rate. Not all effects of hypoxia are bad. In fact all wounds initially have areas of hypoxic tissue. Local hypoxia in the micro-environment of the wound causes several wound healing processes to occur such as leukocyte adherence, neovascularisation, collagen formation and bone formation. When hypoxia is severe, prolonged or widespread deleterious tissue effects can occur. Ischaemia-reperfusion injury: When hypoxia extends beyond the local wound environment the effects of ischaemia-reperfusion injury can be seen. Reactive oxygen species are produced, including oxygen free radicals. Initially, these usually cause vasoconstriction followed by vasodilation, although the effects are dependent on vascular epithelial receptors in the tissue involved. Endothelial cell damage and release of prostaglandins, inflammatory cytokines (TNF-alpha and IL-6) and nitric oxide (NO) from the vascular endothelium occurs. Subsequent membrane peroxidation further increases the cellular damage. As capillaries become leaky and interstitial oedema accumulates, circulation is further compromised with compounded injury. The surgical or medical re-establishment of interrupted circulation sends blood to the ischaemic area, providing new oxygen substrate for the formation of more free radicals, with the result that the injury temporarily worsens. In massive injury the release of inflammatory cytokines (and possibly free radicals) escapes the normal regulatory mechanisms and can lead to multiple organ failure. Hence a long and catastrophic chain of events can be initiated by oxygen deprivation. HBO2 can provide pharmacological doses of oxygen to healing tissue. A typical wound care treatment dive consists of providing 90 minutes of 100% oxygen at 45 feet of sea water (fsw) - 13.7 m of sea water (msw) or 1.38 Bar. This is the equivalent of 2.36 (ATA) atmospheres of 100% oxygen. In recompression therapy for diving-related injuries a patient might be exposed to a minimum of four hours oxygen at depths varying from 60 fsw (18.3 meters, 2.8 atmospheres, 284 kilopascals) to the surface. Hyperbaric chambers are either multiplace or monoplace. A multiplace chamber is able to treat several patients at one time with a medical attendant in the chamber Figure 1. The patients breathe oxygen through a mask or hood Figure 2. In a monoplace chamber one patient is treated in a small hyperbaric chamber filled with 100% oxygen Figure 3. Table 1: Tissue PO2 values (tcpO2 = transcutaneous oxygen pressure). Adapted from Sheffield PJ. Measuring tissue oxygen tension: a review. Undersea Hyperb Ned 1998; 25: 179-88. Pressure effects of oxygen: The effect of elevating the ambient partial pressure of the inspired gas, usually to 2.38 ATAs, is unimportant in wound healing, but quite significant when dealing with the gas bubble diseases, decompression sickness and air gas embolism. At elevated pressures the harmful effects of gas bubbles in the tissue are minimised. Our research and that of others on wounds exposed to elevated pressures has demonstrated no evidence of an isolated pressure effect . Vasoconstrictive effects of oxygen: The vasoconstrictive effects of HBO2 can be used to good effect to treat patients. HBO2 causes a significant reduction of oedema, which has been shown to be beneficial in reperfusion injury, crush injury, compartment syndrome, burns, wound healing, and failing flaps . Oxygen diffusion effects: The diffusion of nitrogen out of the tissues in decompression sickness is facilitated by the use of 100% oxygen. In wound healing the beneficial effects of oxygen are primarily related to the concentration of oxygen molecules in the tissue, rather than by diffusion kinetics. However, the rate of oxygen entry into the wound environment is affected by the rate of diffusion from the capillaries. Oedema adversely affects the achievement of high oxygen concentrations in the wound and increases the intercapillary diffusion distance. Even a small increase in tissue oedema can dramatically slow the rate of entry of oxygen into the tissues and can cause tissue hypoxia. 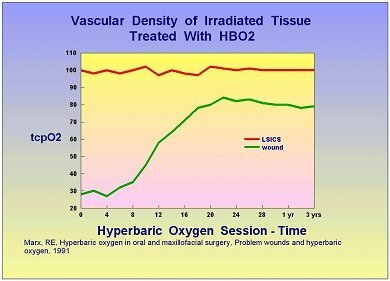 Hyperoxygenation of tissue: The oxygenation of hypoxic tissue is one of the key mechanisms by which HBO2 accelerates wound healing. Numerous studies have shown a dose response curve for the provision of oxygen in the wound healing environment . However, oxygen is a powerful drug and just like other drugs, it is possible to give too little or too much. Chronic wounds are frequently hypoxic and the provision of HBO2 corrects the hypoxia, albeit temporarily. It then allows for acceleration of the wound healing process through processes which continue long after the HBO2 session has ended and tissue oxygen levels have returned to pre-treatment values. Over time the oxygenation of the chronic wound improves with HBO2 therapy. Marx and Johnson demonstrated that for irradiated wounds, HBO2 induces neovascularisation, which becomes significant after about 14 treatments and continues for years after the HBO2 therapy has ceased  Figure 4. A typical chronic wound will usually require 20 to 30 HBO2 treatments. This probably represents the amount of neovascularisation needed to sustain wound healing. Cytokine down regulation and growth factor up-regulation: HBO2 is capable of favourably influencing a number of cytokines and growth factors important to wound healing. When administered after wounding, HBO2 up-regulates collagen synthesis through pro-al(I) mRNA expression . In rabbit ear wounds HBO2 has been shown to up-regulate mRNA for the platelet-derived growth factor (PDGF)-beta receptor . In ischaemic flaps HBO2 up-regulates fibroblast growth factor (FGF) causing an increased effect over that seen with FGF alone . In situations where FGF is ineffective, HBO2 can render it highly effective , although the effect is different from up-regulation. In patients with Crohn's disease interleukin-1 (IL-1), IL-6, and tumour necrosis factor (TNF)-alpha levels are diminished during HBO2 treatment . TNF levels in normal rats become elevated after a single exposure to HBO2 . For different physiological conditions HBO2 may cause up- or down regulation of cytokines. Vascular endothelial growth factor (VEGF) is up-regulated by hypoxia, yet the hyperoxia of HBO2 also up-regulates this factor . The effects of transforming growth factor (TGF)-beta1 and platelet-derived growth factor (PDGF)-beta are synergistically enhanced by HBO2 . Some biological processes and growth factors are stimulated or up-regulated by hypoxia and by HBO2. To date we have identified angiogenesis, collagen synthesis, osteoclastic activity, and release of VEGF. Other possible candidates are TNF-alpha and erythropoietin (EPO). However, it is unclear how oxygen is able to stimulate biological processes in both hypoxic and hyperoxic concentrations. I have called this paradoxical relation between oxygen and wound healing the 'Oxygen Paradox'. One known mechanism is that by which fibroblasts are stimulated to make collagen through peroxides. These occur in the hypoxic wound and during HBO2 treatment . Peroxides generated by HBO2 mimic one of the stimuli also found in hypoxia. Another mechanism is the stimulation of cytokines by hypoxia and further up-regulation of these cytokines by hyperoxia, which occurs during HBO2 treatment. This is the case for some interleukines and for TNF. There is some confusion on the exact timing of the release of growth factors and cytokines; in one study VEGF, TNF-alpha, and TGF-beta occurred in hypoxic wounds after they had been released in normoxia. VEGF, TGF-beta, and PDGF-beta have biphasic release patterns; their release is stimulated by hypoxia and hyperoxia, but is lowest during normoxia . Furthermore, the activity of released VEGF is further enhanced during hyperoxia, especially in the presence of lactate . It is clear that biologically active chemicals such as cytokines and growth factors have a complex array of stimuli to up and down regulate activity. Oxygen, cytokines and biologically active chemicals and metals appear to have key roles in wound healing processes. As we learn more about the role of oxygen, it appears to be much more detailed than in a simple mass-action equation. Oxygen is key to the phagocytosis and killing of bacteria by neutrophils or polymorphonuclear cells (PMNs). This process involves the production of oxygen radicals and superoxides and is directly influenced by the oxygen concentration in the tissue. As the oxygen tension falls below 30 mmHg the efficiency of bacteriocidal action of PMNs begins to drop off dramatically . This was demonstrated by Knighton et al in 1984 where the phagocytic activity of neutrophils in ingesting Staph. aureus was compared to oxygen tension . The activity level of phagocytosis is shown in Figure 5. PMN-mediated killing of several aerobic bacteria - Proteus vulgaris, Salmonella typhimurium, Klebsiella pneumoniae, Serratia marcescens, Pseudomonas aeruginosa and Staphylococcus species - is diminished in hypoxia . Increasing the concentration of oxygen over ambient levels has been shown to reduce infection . When supplemental oxygen was administered during a surgical operation and for two hours postoperatively, infection rates dropped by as much as 54% . Thus, increasing tissue concentrations of oxygen has a beneficial effect on the ability of PMNs to combat bacteria and prevent infection. Support of infected hypoxic tissue: Soft tissue and bone infections are frequently accompanied by localised areas of tissue hypoxia caused by the inflammatory processes accompanying infection and by subsequent vascular thrombosis . As the infected tissue becomes infiltrated with inflammatory cells (PMNs and platelets) the PO2 falls . In clostridial gas gangrene the production of phospholipase C has been associated with platelet and neutrophil aggregation and vascular thrombosis with subsequent hypoxia . Administration of HBO2 can cause the PO2 to increase five-fold in infected tissue . Neutrophil activation: As tissue PO2 rises, leukocyte killing of bacteria becomes much more efficient. Below a PO2 of 30 mmHg PMN killing is markedly reduced . Because areas of hypoxia accompany serious tissue infections, HBO2 is an effective means of raising tissue PO2 to levels at which PMNs can function effectively. By raising tissue PO2 to levels higher than that achieved by breathing oxygen at ambient pressure, bacterial killing by PMNs is further enhanced . Thus, by increasing tissue oxygen tension, a better than 'normal' antibacterial effect can be achieved. Hunt and colleagues have demonstrated that the clearance of bacteria from hypoxic tissue is enhanced by hyperoxic breathing mixtures Figure 6. Enhancement of macrophage activity: Macrophages, like PMNs, are affected by tissue oxygen tension. They perform a key role in combating infection by scavenging bacteria and foreign material. Under hypoxic conditions macrophages are unable to scavenge effectively and produce peroxides . Hypoxia also induces macrophages to produce the inflammatory cytokines TNF-alpha, IL-1, IL-8, and intracellular adhesion molecule-1, which can adversely affect the response to infection . While it is not yet known whether HBO2 can enhance macrophage function, it may be needed to bring the PO2 of hypoxic tissue up to normal levels so that macrophages can function normally. Inhibition of bacterial growth: Anaerobic bacteria are particularly susceptible to increased concentrations of oxygen . The more sensitive the anaerobic organism is to oxygen, the lower the level of superoxide dismutase, an enzyme that allows cells to defend themselves against oxygen free radicals . With HBO2 large amounts of oxygen free radicals can be generated, making anaerobic bacteria particularly susceptible to oxidative killing. HBO2 treatment of anaerobic infections caused by Clostridial perfringens has increased patient survival, reduced the need for additional surgery, shortened hospital stay and improved outcome . When used appropriately in Fournier's gangrene, a rapidly progressing necrotising infection of the perineum, HBO2 has reduced morbidity, extension of necrosis, and systemic toxicity . Inhibition of endotoxin release: In C. perfringens infections the major source of tissue injury and death is caused by the alpha toxin. Secretion of this toxin is suppressed by HBO2 . In rats exposed to E. coli peritonitis, HBO2 administration increased survival from 0% to 92% . One of the mechanisms by which HBO2 appears to have worked is by antagonising some of the harmful effects of bacterial endotoxin release. However, to be optimally effective, HBO2 must be given early in the course of infection and combined with appropriate surgical debridement and antibiotics . Potentiation of antibiotics: Both Knighton et al  and Hunt et al  have demonstrated that oxygen adds to the effectiveness of antibiotics; the greater the concentration of oxygen, the more pronounced the effect Figure 7. This has been demonstrated in experimental Staph. aureus osteomyelitis treated with cefazolin . In Pseudomonas aeruginosa infections HBO2 has an additive effect with aminoglycoside antibiotics, reducing morbidity and mortality . While HBO2 has an admirable safety record, those recommending HBO2 in wound care should be aware of potential side effects and complications. Ear and sinus barotrauma: Middle ear barotrauma is the most common side effect of HBO2. Published reports indicate an incidence of 2-17%, and our experience with an elderly wound care population is consistent with this . Fortunately most cases of barotrauma are minor and can be prevented by extra time spent in teaching the Valsalva manoeuver used on descent, slowing the descent rate, and trying other manoeuvers on descent such as drinking water with the nostrils occluded and head tilt during Valsalva. Those patients who cannot clear the middle ear during pressurisation will need to discontinue treatment and have pressure equalisation (PE) tubes inserted. The paranasal sinuses are also a possible site of barotrauma on descent. Because of this, patients with a cold, upper respiratory tract infection, or allergic rhinitis are not suitable candidates for HBO2. If a patient experiences sinus barotrauma during descent, the treatment dive is suspended and attention given to clearing the sinus. Oxymetazoline hydrochloride 0.05% (Afrin) nasal spray may be of help. Myopia: Some patients receiving HBO2 will develop reversible myopia. The action of HBO2 on the ocular lens is as yet undefined, but may be due to oxidative change of the lens proteins . After cessation of therapy, the refraction usually returns to the pretreatment state within a few weeks . The amount of change in the lens is related to the dose and frequency of HBO2 sessions . Patients with wound problems are usually given 20 to 50 HBO2 treatments, with most patients receiving 30 treatments or less. For most of our patients experiencing myopia it has been a temporary problem. Aggravation of congestive heart failure: HBO2 causes increased peripheral vascular resistance from its vasoconstrictive effects. A decrease in heart rate, cardiac output, and cardiac load has been described in healthy dogs . Blood flow to the left ventricle has been noted to decrease during HBO2 . We have had patients with severe congestive heart failure suffer a precipitous decline in cardiac function after receiving HBO2. Because of this we generally do not accept patients with a cardiac ejection fraction of less than 35% for HBO2. Oxygen seizures: Oxygen is capable of causing grand mal seizures if breathed under pressure for a long enough period of time. Some individuals are more sensitive to oxygen than others and the exact dose of oxygen needed to provoke a seizure is quite variable. The mechanism is unclear but may be due to increased delivery of oxygen free radicals to the brain . Ionic calcium has also been implicated . In our wound treatment dives, 2.4 ATA of oxygen is given for 90 minutes, broken up into three 30-minute periods with 10 minute air breaks between the oxygen periods. Using this procedure, the incidence of oxygen induced seizure is quite rare, 1:10,000 dives . Pulmonary barotrauma: Pulmonary barotrauma is a potentially serious complication of HBO2. The injury is related to pressure changes and occurs only on ascent. For the lungs to be injured there must be an obstruction such as a closed glottis or bronchial obstruction after reaching depth. During ascent the trapped air will expand, injuring the lung. An ascent of 3.5 feet (1.07 meters) would cause a trapped air bubble to exert 80 mmHg (10.7 kilopascals) pressure, enough to rupture alveoli. An untreated pneumothorax is an absolute contradiction to HBO2 therapy and patients with a pneumothorax must have a chest tube inserted prior to the treatment dive. If a pneumothorax occurs during the treatment, a chest tube must be inserted prior to ascent to prevent a marked deterioration in the condition of the patient. Patients with severe obstructive pulmonary disease such as untreated asthma or severe chronic obstructive pulmonary disease (COPD), with air trapping or bleb formation, could be at risk of pneumothorax and should be excluded from diving. However, many of our patients have previously been cigarette smokers and have mild COPD, but dive without incident. Hyperbaric oxygen is a powerful treatment for acute and chronic wounds, acting on injured and healing tissue in a number of ways. Hypoxic tissue, reperfusion injury, compartment syndrome, crush injury, failing flaps, chronic wounds, burns and necrotising infections have all been shown to respond favourably to HBO2. As we learn more about how HBO2 benefits wounds by up-regulating growth factors, down regulating cytokines, reducing oedema, and supporting angiogenesis and new tissue ingrowth, the potential benefits to wound healing become clearer. 1. Phillips JL. Air as medicine In: Phillips JL, editor. The Bends. New Haven: Yale University Press, 1998; 197-203. 2. Churchill-Davidson I, Sanger C, Thomlinson RH. 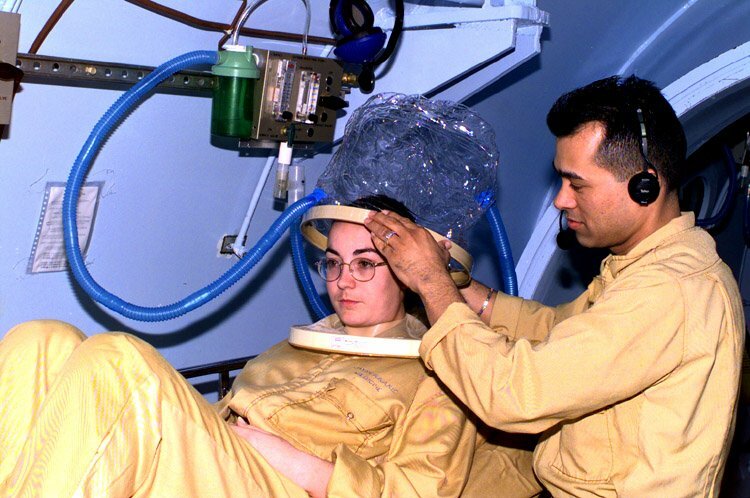 High pressure oxygen and radiotherapy. Lancet 1955; 1: 1091-95. 3. Boerema I, Kroll J, Meijine NG, Lokin E, Kroon JB, Huiskes JW. High atmospheric pressure as an aid to cardiac surgery. Arch Chir Neerl 1956; 8: 193-211. 4. Brummelkamp WH, Hogendijk J, Boerema I. Treatment of anaerobic infections (clostridial myositis) by drenching the tissues with oxygen under high atmospheric pressure. Surgery 1961; 49: 299-302. 5. Smith G, Sharp GR. Treatment of coal gas poisoning with oxygen at two atmospheres pressure. Lancet 1962; 1: 816-19. 6. Wada J, Ikeda T, Kamata K, Ebuoka M. Oxygen hyperbaric treatment for carbon monoxide poisoning and severe burn in coal mine (Hokutanyubari) gas explosion. Igakunoaymi (Japan) 1965; 54-68. 7. Feeley TW. The postanesthesia care unit. In: Miller RD, editor. Anesthesia, 4th edition New York: Churchill Livingstone, 1994; 2307-25. 8. Mathieu D, Wattel F, Bouachour G, Billard V, Defoin JF. Post-traumatic limb ischemia: prediction of final outcome by transcutaneous oxygen measurements in hyperbaric oxygen. J Trauma 1990; 30(3): 307-14. 9. Bouachour G, Cronier P, Gouello JP, Toulemonde JL, Talha A, Alquier P. Hyperbaric oxygen therapy in the management of crush injuries: a randomized double-blind placebo-controlled clinical trial. J Trauma 1996; 41(2): 333-9. 10. Zaroff LI, Walker HL, Lowenstein E, Evans BW, Kroos LS. Hyperbaric oxygen in aerobic infections. Arch Surg 1965; 91(4): 586-8. 11. Nylander G, Nordstrom H, Eriksson E. Effects of hyperbaric oxygen on oedema formation after a scald burn. Burns Incl Therm Inj 1984; 10(3): 193-6. 12. Shupak A, Gozal D, Ariel A, Melamed Y, Katz A. Hyperbaric oxygenation in acute peripheral posttraumatic ischemia. J Hyperbaric Med 1987; 2: 7-14. 13. Skyhar MJ, Hargens AR, Strauss MB, Gershuni DH, Hart GB, Akeson WH. Hyperbaric oxygen reduces edema and necrosis of skeletal muscle in compartment syndromes associated with hemorrhagic hypotension. J Bone Joint Surg Am 1986; 68(8): 1218-24. 14. McFarlane RM, Wermuth RE. The use of hyperbaric oxygen to prevent necrosis in experimental pedicle flaps and composite skin grafts. Plast Reconstr Surg 1966; 37(5): 422-30. 15. Gottrup F, Firmin R, Hunt TK, Mathes SJ. The dynamic properties of tissue oxygen in healing flaps. Surgery 1984; 95(5): 527-36. 16. Jurell G, Kaijser L. The influence of varying pressure and duration of treatment with hyperbaric oxygen on the survival of skin flaps. An experimental study. Scand J Plast Reconstr Surg 1973; 7(1): 25-8. 17. Gruber RP, Brinkley FB, Amato JJ, Mendelson JA. Hyperbaric oxygen and pedicle flaps, skin grafts, and burns. Plast Reconstr Surg 1970; 45(1): 24-30. 18. Stevens DM, Weiss DD, Koller WA, Bianchi DA. Survival of normothermic microvascular flaps after prolonged secondary ischemia: effects of hyperbaric oxygen. Otolaryngol Head Neck Surg 1996; 115(4): 360-4. 19. Thom SR, Mendiguren I, Hardy K, Bolotin T, Fisher D, Nebolon M, Kilpatrick L. Inhibition of human neutrophil beta2-integrin-dependent adherence by hyperbaric O2. Am J Physiol 1997; 272(3 Pt 1): C770-7. 20. Marx RE, Johnson RP. Problem wounds in oral and maxillofacial surgery: The role of hyperbaric oxygen. In: Davis JC, Hunt TK, editors. Problem Wounds - the role of oxygen. New York: Elsevier, 1988; 65-123. 21. Ishii Y, Myanaga Y, Shimojo H, Ushida T, Tateishi T. Effects of hyperbaric oxygen on procollagen messenger RNA levels and collagen synthesis in the healing of rat tendon laceration. Tissue Eng 1999; 5: 279-86. 22. Bonomo SR, Davidson JD, Yu Y, Xia Y, Lin X, Mustoe TA. Hyperbaric oxygen as a signal transducer: upregulation of platelet derived growth factor-beta receptor in the presence of HBO2 and PDGF. Undersea Hyperb Med 1998; 25(4): 211-6. 23. Bayati S, Russell RC, Roth AC. Stimulation of angiogenesis to improve the viability of prefabricated flaps. Plast Reconstr Surg 1998; 101(5): 1290-5. 24. Wu L, Pierce GF, Ladin DA, Zhao LL, Rogers D, Mustoe TA. Effects of oxygen on wound responses to growth factors: Kaposi's FGF, but not basic FGF stimulates repair in ischemic wounds. Growth Factors 1995; 12(1): 29-35. 25. Weisz G, Lavy A, Adir Y, Melamed Y, Rubin D, Eidelman S, Pollack S. Modification of in vivo and in vitro TNF-alpha, IL-1, and IL-6 secretion by circulating monocytes during hyperbaric oxygen treatment in patients with perianal Crohn's disease. J Clin Immunol 1997; 17(2): 154-9. 26. Lahat N, Bitterman H, Yaniv N, Kinarty A, Bitterman N. Exposure to hyperbaric oxygen induces tumour necrosis factor-alpha (TNF-alpha) secretion from rat macrophages. Clin Exp Immunol 1995; 102(3): 655-9. 27. Hunt TK. Oxygen and wound healing. In: Hyperbaric Medicine 2000, 8th Annual Advanced Symposium. Columbia: S.C. Palmetto Richland Memorial Hospital and the University of South Carolina School of Medicine, 2000. 28. Zhao LL, Davidson JD, Wee SC, Roth SI, Mustoe TA. Effect of hyperbaric oxygen and growth factors on rabbit ear ischemic ulcers. Arch Surg 1994; 129(10): 1043-9. 29. Gleadle JM, Ratcliffe PJ. Hypoxia and the regulation of gene expression. Mol Med Today 1998; 4(3): 122-9. 30. Haroon ZA, Raleigh JA, Greenberg CS, Dewhirst MW. Early wound healing exhibits cytokine surge without evidence of hypoxia. Ann Surg 2000; 231(1): 137-47. 31. Allen DB, Maguire JJ, Mahdavian M, Wicke C, Marcocci L, Scheuenstuhl H, Chang M, Le AX, Hopf HW, Hunt TK. Wound hypoxia and acidosis limit neutrophil bacterial killing mechanisms. Arch Surg 1997; 132(9): 991-6. 32. Babior BM. Oxygen-dependent microbial killing by phagocytes. N Engl J Med 1978; 298(13): 659-68. 33. Knighton DR, Halliday B, Hunt TK. Oxygen as an antibiotic. 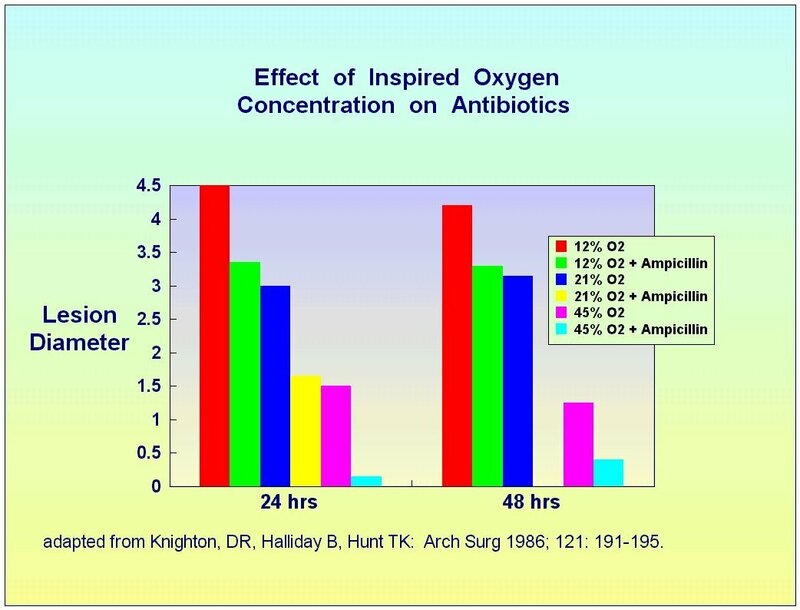 The effect of inspired oxygen on infection. Arch Surg 1984; 119(2): 199-204. 34. Hohn DC. Host resistance of infection: Established and emerging concepts. In: Hunt TK, editor. Wound Healing and Wound Infection. New York: Appleton-Century-Crofts, 1980; 264-280. 35. Knighton DR, Halliday B, Hunt TK. Oxygen as an antibiotic. A comparison of the effects of inspired oxygen concentration and antibiotic administration on in vivo bacterial clearance. Arch Surg 1986; 121(2): 191-5. 36. Greif R, Akca O, Horn EP, Kurz A, Sessler DI. Supplemental perioperative oxygen to reduce the incidence of surgical-wound infection. Outcomes Research Group. N Engl J Med 2000; 342(3): 161-7. 37. Bryant AE, Chen RY, Nagata Y, Wang Y, Lee CH, Finegold S, Guth PH, Stevens DL. Clostridial gas gangrene. II. Phospholipase C-induced activation of platelet gpIIbIIIa mediates vascular occlusion and myonecrosis in Clostridium perfringens gas gangrene. J Infect Dis 2000; 182(3): 808-15. 38. Silver IA. Tissue PO2 changes in acute inflammation. Adv Exp Med Biol 1978; 94: 769-74. 39. Korhonen K, Kuttila K, Niinikoski J. Tissue gas tensions in patients with necrotising fasciitis and healthy controls during treatment with hyperbaric oxygen: a clinical study. Eur J Surg 2000; 166(7): 530-4. 40. Hohn DC, MacKay RD, Halliday B, Hunt TK. Effect of O2 tension on microbicidal function of leukocytes in wounds and in vitro. Surg Forum 1976; 27(62): 18-20. 41. Mader JT, Adams KR, Sutton TE. Infectious diseases: Pathophysiology and mechanisms of hyperbaric oxygen. J Hyperbar Med 1987; 2: 133-40. 42. Conolly WB, Hunt TK, Sonne M, Dunphy JE. Influence of distant trauma on local wound infection. Surg Gynecol Obstet 1969; 128(4): 713-8. 43. Hunt TK, Linsey M, Grislis H, Sonne M, Jawetz E. The effect of differing ambient oxygen tensions on wound infection. Ann Surg 1975; 181(1): 35-9. 44. Mrotek JJ, Henderson R, Kiel J, et al. Normobaric oxygen concentrations affect cultured mouse macrophage responses. Fed Proc 1986; 45: A958. 45. Scannell G. Leukocyte responses to hypoxic/ischemic conditions. New Horiz 1996; 4(2): 179-83. 46. Gottlieb SF. Effect of hyperbaric oxygen on microorganisms. Annu Rev Microbiol 1971; 25: 111-52. 47. Tally FP, Goldin BR, Jacobus NV, Gorbach SL. Superoxide dismutase in anaerobic bacteria of clinical significance. Infect Immun 1977; 16(1): 20-5. 48. Korhonen K, Hirn M, Niinikoski J. Hyperbaric oxygen in the treatment of Fournier's gangrene. Eur J Surg 1998; 164(4): 251-5. 49. Van Unnick A. Inhibition of toxin production in Clostridium perfringens in vitro by hyperbaric oxygen. Antonie Leewenhoek Microbiol 1965; 31: 181-6. 50. Hill GB, Osterhout S. Experimental effects of hyperbaric oxygen on selected clostridial species: II. In vivo studies in mice. J Infect Dis 1972; 125: 26. 51. Thom SR. Hyperbaric oxygen therapy in septicemia. J Hyperb Med 1987; 2: 141-6. 52. Korhonen K, Klossner J, Hirn M, Niinikoski J. Management of clostridial gas gangrene and the role of hyperbaric oxygen. Ann Chir Gynaecol 1999; 88(2): 139-42. 53. Hunt TK, Linsey M, Grislis HJ, et al. 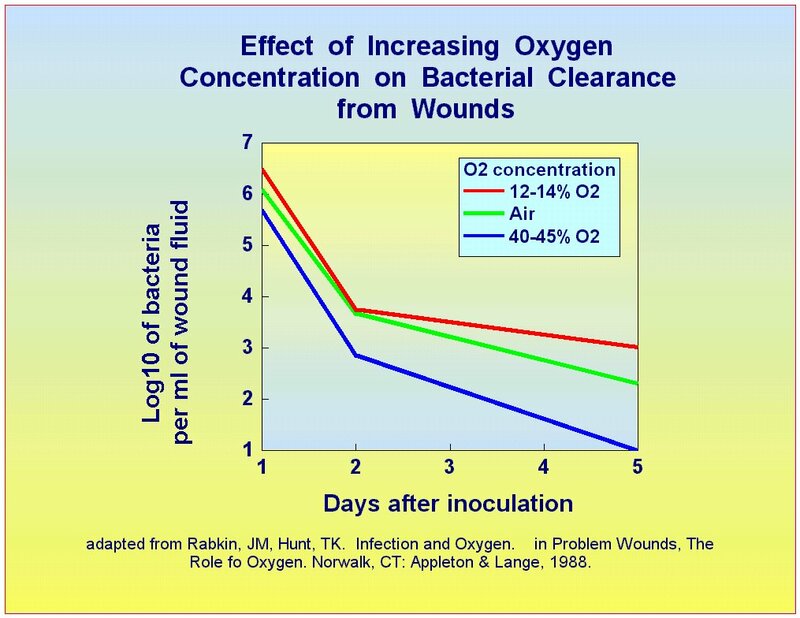 The effect of differing ambient oxygen tensions on wound infection. Ann Surg 1975; 181: 35-9. 54. Mendel V, Reichert B, Simanowski HJ, Scholz HC. Therapy with hyperbaric oxygen and cefazolin for experimental osteomyelitis due to Staphylococcus aureus in rats. Undersea Hyperb Med 1999; 26(3): 169-74. 55. Luongo C, Imperatore F, Matera MG, Mangoni G, Marmo M, Baroni A, Catalanotti P, Rossi F, Filippelli A. Effect of hyperbaric oxygen therapy in experimental subcutaneous and pulmonary infections due to Pseudomonas aeruginosa. Undersea Hyperb Med 1999; 26(1): 21-5. 56. Plafki C, Peters P, Almeling M, Welslau W, Busch R. Complications and side effects of hyperbaric oxygen therapy. Aviat Space Environ Med 2000; 71(2): 119-24. 57. Stone JA, Loar H, Rudge FW. 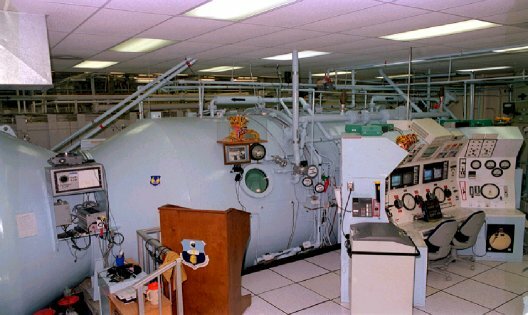 An eleven year review of hyperbaric oxygenation in a military clinical setting. Undersea Biomed Res 1991; 18: 80. 58. Palmquist BM, Philipson B, Barr PO. Nuclear cataract and myopia during hyperbaric oxygen therapy. Br J Ophthalmol 1984; 68(2): 113-7. 59. Ross ME, Yolton DP, Yolton RL, Hyde KD. Myopia associated with hyperbaric oxygen therapy. Optom Vis Sci 1996; 73(7): 487-94. 60. Anderson B, Jr, Shelton DL. Axial length in hyperopic myopia. In: Bove AA, Bachrach AJ, Greenbaum LI, Jr, editors. Underwater and Hyperbaric Physiology IX. Proceedings of the Ninth International Symposium on Underwater and Hyperbaric Physiology. Bethesda, MD: Undersea and Hyperbaric Medical Society, 1987. 61. Lyne AJ. Ocular effects of hyperbaric oxygen. Trans Ophthalmol Soc UK 1978; 98(1): 66-8. 62. Abel FL, McNamee JE, Cone DL, Clarke D, Tao J. Effects of hyperbaric oxygen on ventricular performance, pulmonary blood volume, and systemic and pulmonary vascular resistance. Undersea Hyperb Med 2000; 27(2): 67-73. 63. Bergo GW, Risberg J, Tyssebotn I. Effect of 5 bar oxygen on cardiac output and organ blood flow in conscious rats. Undersea Biomed Res 1988; 15(6): 457-70. 64. Chavko M, Harabin AL. Regional lipid peroxidation and protein oxidation in rat brain after hyperbaric oxygen exposure. Free Radic Biol Med 1996; 20(7): 973-8. 65. Wang WJ, Ho XP, Yan YL, Yan TH, Li CL. Intrasynaptosomal free calcium and nitric oxide metabolism in central nervous system oxygen toxicity. Aviat Space Environ Med 1998; 69(6): 551-5. 66. Davis JC, Dunn JM, Heimbach RD. Hyperbaric medicine: Patient selection, treatment procedures and side effects. In: Davis JC, Hunt TK, editors. Problem Wounds - the role of oxygen. New York: Elsevier, 1988.